(Bloomberg Markets) -- The U.S. government’s debt boom seems to be creating a self-perpetuating cycle of demand, even before March’s surge in buying. That cycle is delaying any comeuppance for the U.S. Department of the Treasury as it contemplates its next trillion dollars of annual borrowing. But how? That’s a notable increase in global exposure to U.S. government debt. Whether or not investors agree about the risks of the U.S. pursuing looser fiscal policy, certainly a lot of their money is on the line. 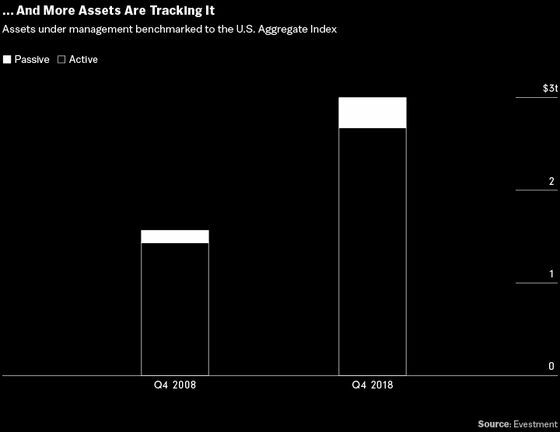 Global assets under management tracking that index alone totaled close to $3 trillion at the end of 2018, according to Evestment data. Roughly $325 billion of that was passively invested, an almost 150 percent increase over the decade. More Treasuries in the index, plus more investors tracking the index, equals more demand for Treasuries. “An increased weight of Treasuries in the benchmark causes benchmark-centric investors to buy more Treasuries at the expense of other riskier sectors, which leads to a crowding out effect,” says Christopher Brown, who heads the total return fixed-income fund at T. Rowe Price. He attributes the slide in credit markets last year to this gravitational pull toward government securities. As a result, he says, investors tracking today’s benchmark may be unwittingly exposed to more interest-rate risk than is good for them. As the proportion of Treasuries increases in the index, so does its sensitivity to interest-rate movements, Brown says. “You’re getting less exposure to other spread sectors that could help offset some of that sensitivity,” he says. This risk of crowding out is debatable. While the share of the U.S. Aggregate index devoted to government agency debt and securitized debt has fallen since the 2008 financial crisis, that of corporate bonds has risen as companies stepped up issuance to lock in historically low interest rates. But the pace has lagged Treasuries. Corporate bonds account for about a quarter of the index now, up from 18 percent a decade ago. That leverage has come at a cost: The quality of corporate debt has slipped a couple of notches on the ratings scale. 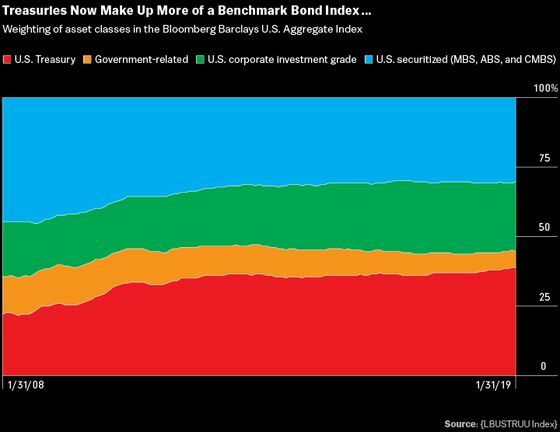 Corporate borrowers may feel the pinch before long if investors start demanding more compensation for the widening gap in credit quality over risk-free government bonds. By contrast, the feedback loop of fund investments into Treasuries has helped curb the cost of the government’s borrowing by stoking demand just as some foreign governments and central banks were scaling back their own purchases. The 10-year yield held below 3 percent for much of the past year, even though solid economic growth and the lowest unemployment rate in a generation was spurring the Federal Reserve to raise short-term borrowing costs. The 10-year rate fell below 2.4 percent once renewed global growth concerns led to a pause in the Fed’s tightening cycle this year. “People intuitively understand that there’s not going to be a financial crisis associated with government debt in the U.S., but then they take the leap that therefore there’s nothing to worry about,” says William Gale, a senior fellow at the Brookings Institution and former staffer on the Council of Economic Advisers under President George H.W. Bush. While he’s not predicting a shock, Gale is troubled by the long-term trajectory and implications of today’s expansive U.S. fiscal policy. He’s focused on how the debt burden could displace government spending that would do more to benefit U.S. growth and households. The Congressional Budget Office estimates that net interest payments could outstrip spending on Medicaid next year and surpass defense spending in 2025.